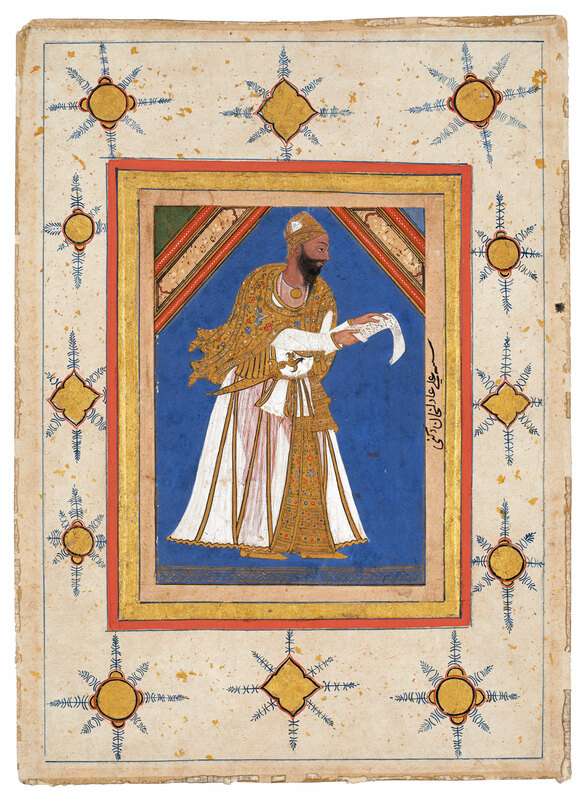 The Asia and African Collections department at British Library (BL) is pleased to announce an exciting line-up of talks in April-May 2018, featuring a diverse array of subjects such as Muharram, Delhi waters, Tipu Sultan’s library collection, Sufism and Persian manuscripts, Mughal musical rivalries, colonial police and food! This is a series of talks based around the British Library’s ‘Two Centuries of Indian Print’ and the South Asian collections. The speakers will range from scholars and academics in the UK and elsewhere as well as our own curators, who will share their original and cutting-edge research, followed by discussions facilitated by BL curators and other specialists in the field. The presentations will take place at the Foyle Learning Centre at the British Library, between 5.30-7.00pm. On 16th April 2018, David Lunn, Simon Digby Postdoctoral Fellow at SOAS, will talk about transformations in the Shi’a festival of Muharram, which commemorate the martyrdom of Imam Hussain, in South and Southeast Asia during the colonial period. His talk entitled ‘Painting, Singing, and Telling Muharram in 19th-century India and Singapore’ focuses on various examples of art work from India in the British Library collections; the ‘Muharram processional scroll’, a painting from c. 1840 Madras now in the Asian Civilisations Museum, Singapore; and the Syair Tabut, a 146-quatrain Malay narrative poem from 1864 Singapore. These representations of Muharram will be viewed in the context of colonial era contests over public space and access to it. Matt Birkinshaw, who recently completed his PhD in Geography at LSE, focuses on a long history of urban water provision in Delhi on 23rd April 2018. In his talk ‘Waters of Delhi: Continuity and Change under Mughal, Company and British Rule’, he examines how Delhi transformed from being a city with a sophisticated systems of well, channels and canal under Mughal rule to becoming a dangerously unhealthy city with inadequate water and drainage concerns under British rule. In his talk he will trace how water was understood and accessed under different systems of rule, the changes and continuities in water supply and their present day relevance. In our last talk in April, Ursula Sims-Williams, Lead Curator of Persian Collections, British Library, in her talk on 30th April, ‘Researching the Manuscript Collection of Tipu Sultan of Mysore’, will explore some of the rare and valuable manuscripts at the British Library that were once part of Tipu Sultan’s Library collection. Tipu Sultan of Mysore is one of the most colourful characters in the history of South Asia. On the one hand he is often castigated as a fanatical Muslim and brutal ruler but at the same time he is regarded by many as a martyr whose wars against the British foreshadowed the historic uprising of 1857 by around 50 years. On the basis of his collection, Ursula Sims-Williams will shed new light on the charismatic Tipu Sultan, whose library at the time of the fall of Seringapatam in 1799, was estimated to consist of about 2000 volumes. We will begin May with another talk from one of our curators! On Wednesday 9th May, Sâqib Bâburî, Curator, Persian Manuscripts Digitisation Project, will talk on ‘Sufism and Persian Manuscripts from the Delhi Collection’. Acquired by the Government of India in 1859, the ‘Delhi Collection’ was transferred to the India Office Library in 1876, and is now part of the British Library's collections. Sâqib Bâburi in his talk explores some of the rare manuscripts in the Delhi collection that specifically deal with Sufism, mysticism and metaphysics to help illustrate Delhi’s diverse spiritual traditions. Katherine Butler Schofield, Senior Lecturer in Music at King’s College London, will present on the 14th May 2018 on musical rivalries in Mughal times as part of her series of talks at the British Library entitled Histories of the Ephemeral: Writing about Music in Late Mughal India. Her talk ‘The Rivals: Anjha Baras Khan, Adarang, and What Happened to Muhammad Shah’s Court’ based on 18th and early 19th musician biographies, a genre new to writing on music at the time, will offer unusual access to the history of elite artisans on the move in late Mughal and early colonial India. The biographies offer themselves as both a product and a record of the upheaval, dispersal, diversification and innovation of those times. On 21st May 2018, we have a talk on ‘Police in Colonial India: A Study of the Recruitment of Constabulary Labour in Late Nineteenth Century Bengal’, given by Partha Pratim Shil, Junior Research Fellow for research in History at Trinity College, Cambridge. The talk examines the archival corpus at the British Library for the study of the police establishment in Colonial Bengal. Using the police archive, Partha Pratim Shil demonstrates the different and new ways of looking at the recruitment of workers at the lowest rungs of the police, i.e., the constabulary in the Bengal and Calcutta Police establishments, in the late nineteenth century. The talk reveals how colonial police officials had to dip into the wider market of security work in Bengal to derive its constabulary, and how the operation of this labouring world shaped the colonial state apparatuses. We end our spring talks on 30th May 2018 with a presentation by Preeti Khosla, an independent scholar, on Mughal-era cookbooks. Her talk entitled ‘Reintroducing the Celebrated Niʿmatnāmah Half a Century Later ‘brings to life the gastronomic delights, aromas and indulgences of the 16th century Malwa court using the British Library manuscript, the Niʿmatnāmah. Dedicated to the Malwa Sultans, Ghiyas-al-Din Shah and Nasir-al-Din Shah, its many illustrations and accompanying text provide a rare vista into the decadence of this Sultanate court and its obliging female retinue. Evidently an illustrated manuscript that was esteemed over the centuries, this talk takes another look at the celebrated Niʿmatnāmah more than half a century after it came to light. No advance booking for these talks is required, and the sessions are free to attend. For further info, please contact Dr. Layli Uddin, Project Curator of ‘Two Centuries of Indian Print’ at layli.uddin@bl.uk. Please do come along, listen and participate!